The Barracuda restaurant is located on the verdant hill of Campagnano. Here, with a suggestive and unique view dominating the gulf of Naples, you can spend unique and unforgettable moments, completely relaxed in the open spaces of the charming garden that frames our flowering terraces. Moreover, there is also a welcoming and elegant dining room for ceremonies and important moments. Fish is the chief protagonist in our cuisine, with live shellfish and rigorously fresh fish. 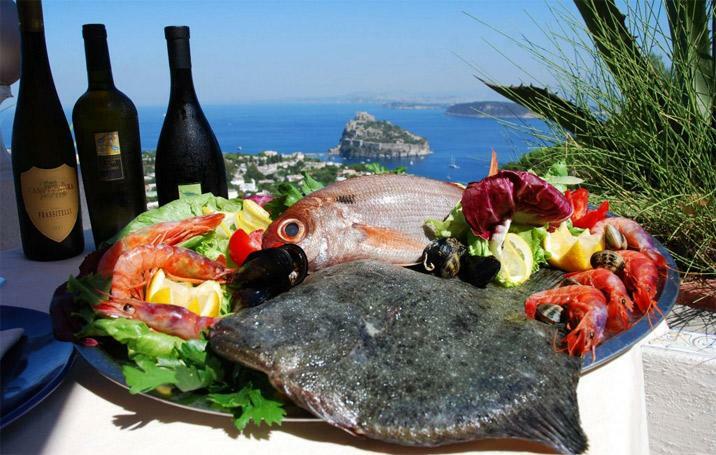 What is more, the needs of those who do not happen to like fish are satisfied by various homemade specialities and an excellent pizza baked in the traditional wood-burning oven, all accompanied by an excellent wine cellar and as always, the charm and professionalism of our personnel. Inside the restaurant we provide our customers with a complete and detailed display of corals, shells and fossils, found after years of research and dangerous immersions in the depths of the seas the world over; a truly unique experience. The fresh fish is protagonist of the cuisine, seafood specialities, guarantee of high level quality. All prepared according the traditional Mediterranean cuisine. A selection of the best meat, grilled outside and the famous rabbit in hole of Ischia, a tradition with the all flavours of the island. A very good pizza cooked in wood oven and a refined choice of national wines. Just a short walk from the suburb of Campagnano, easy to reach by bus and car, a small parking at guests disposal, and a wide public parking. The bus stop is in square, just a short walk from the local entry.